Bone broth had a big moment. For the past few years, dieters and biohackers have embraced it as the answer to staying full, repairing muscles and improving health. Bone broth has been popping up in grocery stores and cafés, being served in drinking vessels instead of soup bowls. But now a new food fad is making its way onto the health and wellness scene: mushroom broth. This plant-powered broth has comparable nutritional benefits, helping to improve gut health, boost the immune system and remineralize the body. Mushroom broth also has a beautiful savoury, nutty umami flavour. Delicious as a hot or cold drink, it can also be used wherever you would typically use stock, such as making soups and cooking grains. Using mushrooms for their medicinal properties is nothing new, especially in Asia, where they have been used for centuries. While recent attention has focused on the immunological and anticancer properties of certain mushrooms, holistic nutritionists say they offer other potential health benefits, including reducing cholesterol, protecting the liver and having antihypertensive, antioxidant, antidiabetic and antiviral properties. 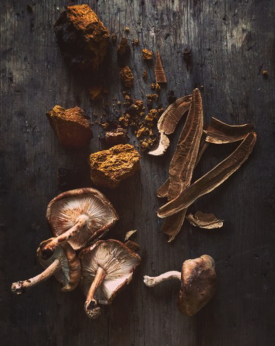 Medicinal properties are highly concentrated in certain mushrooms, such as reishi, chaga and shiitake mushrooms. If you’re unable to find them fresh, they can often be found dried in health food stores, whole or in powder form. Each type of mushroom is said to have its own unique medicinal properties. Reishi mushrooms are thought to have immune-boosting effects, chaga mushrooms are best known for being powerful antioxidants, and shiitake mushrooms are said to have antiviral properties. The mushrooms that you find in your grocery store may not be considered medicinal, but they still have lots to offer. Cremini, portobello, button and oyster mushrooms are also rich in vitamins and minerals. Making broth is a simple way to absorb the many nutrients that mushrooms have to offer. My philosophy when making stock is to use what you have. I keep ginger and miso in my house all the time, but if you don’t have it on hand, feel free to omit it. I also reserve the mushroom stems from portobello and cremini mushrooms that would otherwise get composted. Use dry shiitake mushrooms if fresh ones are too expensive. Feel free to add in dulse, fennel and parsnip to change up the flavors. Place all of the ingredients in a slow cooker on low. Cook for 3 hours, stirring once every hour. Strain contents through a sieve. Reserve broth. Discard everything except for the shiitake mushrooms, which can be saved for future dishes. I love this dish cold, but feel free to warm the broth if you prefer hot soup. Heat oil in a pan over medium high. Add mushrooms and salt; cook until brown and fragrant, about 4 minutes, stirring once or twice. Divide soba noodles between 2 bowls. 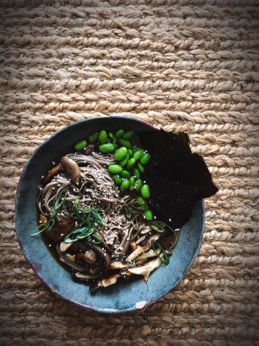 Divide the cooked mushrooms, noodles, edamame, broth, nori and onion between bowls. Garnish with sesame seeds and a drizzle of sesame oil. Thank you for this Mushroom broth recipe. We harvest wild mushrooms and are always looking for ways to make the most of our harvests. I dehydrate most of them. Looking forward to being a member ! When you say slow cooker so you mean crock pot or insta pot- 3 hours seems like a short amount of time for broth. yeah – sure – use all those expensive mushrooms! Plant Powered Broth?! Mushrooms are NOT in the plant kingdom, there is a BIG difference. KPCOFGS.. Science its Real and studied embrace it. I love the mushroom broth recipe ingredients, but I was taught that you should never cook miso, or you lose all the beneficial nutrients. You are supposed to stir it in after you turn off the heat. Is it more about flavor for this recipe? Trying to understand what it is being used for in this recipe. Can’t wait yo make this. What state is trying to or already has legalized psylicibin mushrooms? Yes, do watch out for that magical broth.